Those who enjoy exploring the park by hiking or horseback riding will find many miles of well-marked trails. Meandering through the rolling hills of Brown County State Park are about 70 miles of bridle trails and over 18 miles of hiking trails. You can bring your own horse, or enjoy guided trail rides and pony rides at the Saddle Barn. Picnickers have a variety of picnic areas to choose from, and some have shelters with fireplaces. Many are close to drinking water, restrooms, or playground equipment. There are also several reservable shelter houses throughout the park. 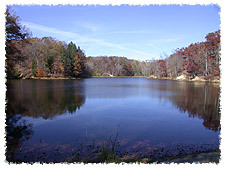 Visitors to Brown County State Park can also enjoy an Olympic-size swimming pool and fishing (or ice fishing) on two lakes. The Nature Center also offers a variety of exhibits, displays and scheduled interpretive naturalist services year-round. 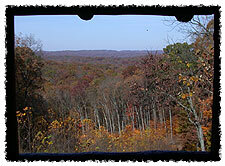 A variety of wildlife species adapted to life in the forest and forest edges can be found at Brown County State Park. Mammals found in the park include white-tailed deer, raccoon and gray squirrel. Birds include robin, white-breasted nuthatch, bluejay, cardinal, junco and crow. Wild turkeys also call the park home, so you might see one If you're lucky. 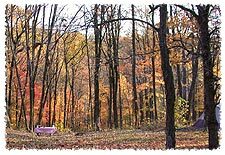 All of the various campgrounds are open year-round at Brown County State Park. Camping choices include Class A (electric) campsites, Class B campsites, Horsemen Class A campsites, Horsemen Class C (primitive) campsites, a Youth Tent Area and a Rally Campground. For visitors preferring all the comforts of home a stay at Abe Martin Lodge is just the ticket. Containing 84 bedrooms itself, the Lodge also operates 24 sleeping cabins (containing 56 bedrooms) and 20 family housekeeping cabins. The Lodge also houses meeting rooms and a public dining room. Enjoy all the beauty and fun without the crowds.